According to the history of Borobudur temple which has 1460 relie, built by the King of kings Smaratungga one of the ancient kingdom of Mataram dynasty Syailendra VIII century. In Sri Kahulunan inscription (842 AD) Borobudur temple was built to glorify the Mahayana Buddhism. There are several opinions about the naming of Borobudur Temple. Casparis quoting from the inscription of Sri Kahulunan the 842 M kamulan i bhumisambharabudara which means holy building that symbolizes the good collection of Bodhisattva. Meanwhile, in his book states Poerbatjaraka Borobudur is the Monastery of Budur (Budur = name of a place / village). Soekmono and Stuterheim argues that Borobudur is a monastery on the hill. According to the legend of Borobudur Temple was built by an architect named Gunadharma, but the truth of the news is hirtoris not known with certainty. Borobudur is the biggest temple in Indonesia. 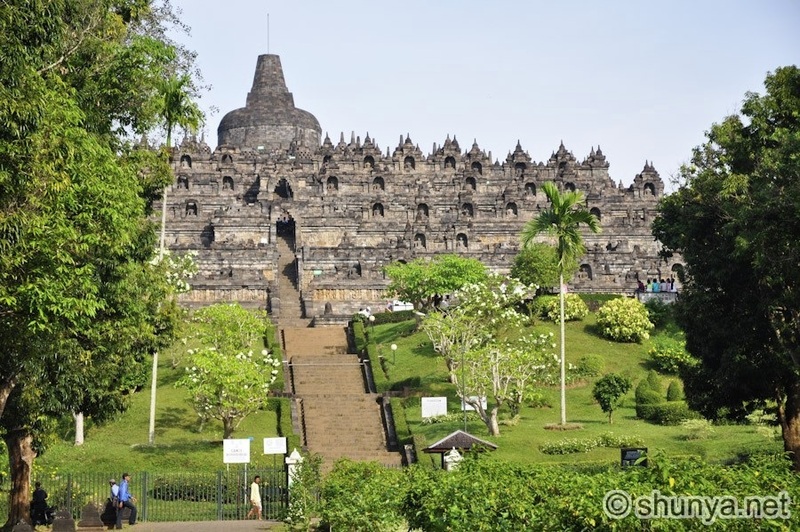 Borobudur temple is located in Magelang, Central Java, in addition to being a busy tourist attraction visited, also a center of worship for Buddhists in Indonesia, especially at every celebration of Vesak. This is in accordance with the meaning of the name of 'convent in the hills ". Borobudur is currently designated as one of UNESCO World Heritage. Borobudur was built around 800 BC or 9th century. Borobudur Temple was built by the Mahayana Buddhists during the reign Sailendra. This temple was built in the heyday of Sailendra dynasty. The founder of the Borobudur Temple King Samaratungga from Sailendra dynasty or dynasties. The possibility of this temple was built around 824 AD and was completed around the year 900 AD in the reign of Queen Pramudawardhani who is the daughter of Samaratungga. While architects who contributed to build this temple according to the story of a hereditary named Gunadharma. Borobudur own words based on the first written evidence, written by Sir Thomas Stamford Raffles, Governor General of the United Kingdom in Java, which gives the name of this temple. There is no written evidence that older who named this temple of Borobudur on. The only document that shows the existence of the oldest temple is Nagarakretagama book, written by mpu Prapanca in 1365. In the book was written that this temple was used as a place of Buddhist meditation. The meaning of the name Borobudur "abbey in the hills", which comes from the word "coal" (temple or monastery) and "beduhur" (hills or high places) in Sanskrit. Therefore, in accordance with the meaning of the name Borobudur, then this place since long ago used as a place of Buddhist worship. This temple for centuries no longer used. Then because of volcanic eruptions, most of the buildings covered Borobudur volcanic soil. In addition, the building is covered with trees and shrubs for centuries. Then the building of this temple began in the time-forgotten Islam arrived in Indonesia around the 15th century. In the year 1814 when the British occupied Indonesia, Sir Thomas Stamford Raffles heard of the discovery of huge archaeological objects in the village of Magelang district Bumisegoro. Because of the great interest of the history of Java, then immediately ordered Raffles HC Cornelius, a Dutch engineer, to investigate the discovery of the location was a hill covered with shrubs. Cornelius assisted by about 200 men cut down trees and remove shrubs that covered the giant building. Because the building is considered fragile and could collapse, then report to the Raffles Cornelius invention includes several images. Since the discovery, Raffles received an award as one who started the restoration of Borobudur and world attention. In 1835, the entire area of the temple has been unearthed. This temple was restored to keep the Dutch colonial period. After Indonesian independence, in 1956, the Indonesian government requested the assistance of UNESCO to examine the damage to Borobudur. Then in 1963, out of the official Indonesian government's decision to conduct the restoration of Borobudur temple with the help of UNESCO. However, this restoration was only really started to be done on August 10, 1973. The process of restoration was completed in 1984. Since 1991, Borobudur Temple, designated as World Heritage or World Heritage Site by UNESCO. 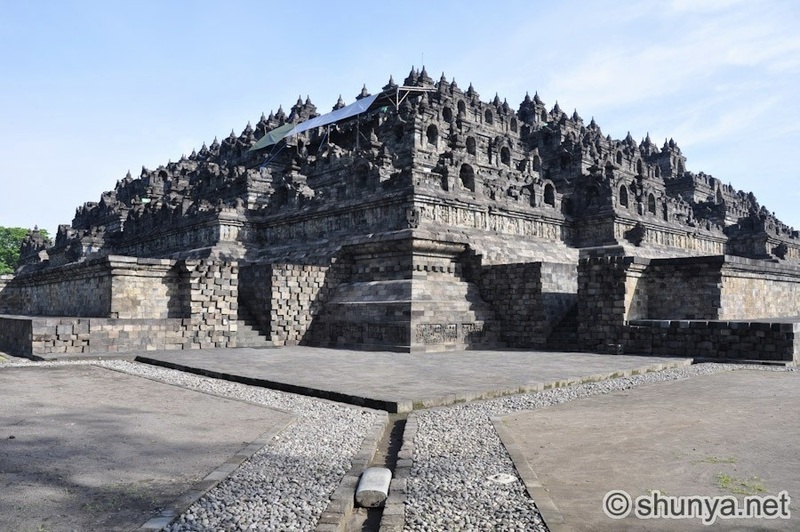 Borobudur temple is located in Magelang, Central Java, about 40 km from Yogyakarta. Borobudur Temple has 10 levels consisting of 6 levels of a square, circular level 3 circular and a main stupa as a peak. At every level there are several stupas. Altogether there are 72 domes in addition to the main stupa. In every stupa there is a statue of Buddha. Ten levels of Buddhist philosophy which describes the ten levels of Bodhisattva which must pass to reach the perfection of the Buddha in nirvana. This perfection symbolized by the main stupa at the top level. Borobudur structure when viewed from above form a mandala structure depicting Buddhist cosmology and the human thinking. On the fourth side there is the temple gate and the stairs to the upper level like a pyramid. This illustrates the Buddhist philosophy that all life came from rocks. Stone later became sand, then into plants, then into the insect, then a wild animal and pets, and the last to be human. This process is known as reincarnation. The last process is the soul and finally went into nirvana. Each stage of enlightenment in this life process based on Buddhist philosophy is illustrated in reliefs and statues in the temple of Borobudur. This huge building just a giant pile of stone blocks which have a total height of 42 meters. Each stone connected without using cement or adhesive. These stones are only connected by patterns and stacked. The base of Borobudur temple is about 118 m on each side. The stones used approximately 55,000 cubic meters. All the stones are taken from the river around the Borobudur Temple. These stones are cut and then transported and connected with a pattern like lego game. All without using glue or cement. Meanwhile, relief began to be made after these rocks are stacked and connected end. Relief is on the temple walls. Borobudur has different relief 2670. Relief is read clockwise. This relief illustrates a story that I read it starts and ends at the gate to the east. This shows that the main gate of the Borobudur temple facing the east like most other Buddhist temples. Borobudur stupa is the world's largest Buddhist monument (as large as a Giza pyramid) and a UNESCO World Heritage site. Located near the city of Jogjakarta on the island of Java, it's a stunning remnant of the days when the Dharmic religions were politically ascendant in the islands. It was commissioned and built by the local monarchs so that devotees need not travel all the way to India for spiritual pilgrimage. Drawing Buddhist pilgrims from as far away as China, its grandeur would have raised the stature of the local monarchs in the eyes of the Buddhist world, which at the time encompassed the whole of southern and eastern Asia. Some say that the site was chosen for being surrounded by three volcanoes, which can be seen in the near distance, and the confluence of two rivers, meant to represent the Ganga and Jamuna of India. Going upward from the bottom, levels 2-6 are covered by scenes from Buddha's life and teachings, carved in low relief, each one of the 3,000 panels entirely unique. These levels are meant to represent the concerns of this material existence. On the next 4 layers one sees only bell-shaped stupas and statues of the Buddha, which represent increasing degrees of perfection and proximity to Nirvana. Altogether, Borobudur monument is adorned with 555 Buddha statues. Its 10 tiers form a mandala when viewed from the sky (which no one in those days could have done). The resulting symmetries and geometries make for an immersive experience of entering a hallowed place. In those days there would have been thousands of monks from all over Asia, making it a great religious center. A surprising feature of the monument is the degree to which the artisans mimicked the Indian style of sculpture and relief. They nearly replicated the look and feel of contemporary Indian Buddhist carvings, while creating an original design for the stupa as a whole. Many of the relief panels are simpler in scope than those from ancient India, yet the craftsmen reproduced very well the fine and nuanced expressiveness of the faces, similar to what one sees on Indian stupas and temples of that period. To accomplish this, legions of Indian craftsmen were brought in to teach, train, and work alongside the local craftsmen. Many of them married in and stayed on here for the rest of their lives. The stupa at Borobudur was in use for only 150 years before the site was abandoned. The local populations fled eastward (probably to Bali), possibly because of insurmountable devastation caused by a volcanic eruption. Thereafter, the monument fell to ruins and was reclaimed by the jungle for almost 800 years. It was finally uncovered by the Dutch and English during colonial times.